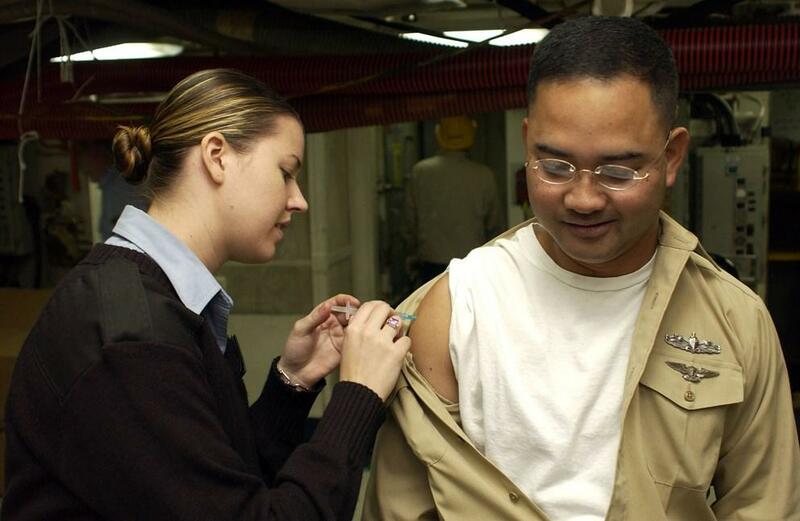 Vaccination; 041028-N-9864S-021 Yokosuka, Japan (Oct. 28, 2004) - Hospital Corpsman 3rd Class Tiffany Long of San Diego, Calif., administers the influenza vaccination to a crew member aboard USS Kitty Hawk (CV 63). Airs Thursday, January 5, 2017, at 6 p.m. Fall and winter are flu season, with peak flu activity usually occurring between December through March. Dr. Randall Brewer will host this Health Matters on flu and flu vaccines. He’ll be joined by Dr. Joseph Bocchini, Pediatric Infectious Disease Specialist at LSU Health; Dr. Gerardo Negron, Infectious Disease Specialist with Willis-Knighton Health System; and Dr. Himanchu Desai with Pulmonary and Critical Care Specialists in Shreveport . Questions will be taken at 1-800-552-8502.